Walnuts are a part of the tree nut family, and have been revered since ancient times as a symbol of intellectuality, because the surface inside the shell resembles the human brain. The walnut kernel consists of two bumpy lobes that are off-white in color and covered by a thin, light brown skin. The most popular walnuts are the English walnut, the black walnut, and the white walnut. The English walnut originated in India and regions surrounding the Caspian Sea, and is the most popular in the United States. Black walnuts are native to North America, specifically Central Mississippi Valley and the Appalachian area. These walnuts have thicker shells that are harder to crack. The white walnut is not as widely available as the other two, but is native to the New England states. Walnut oil is extracted by cold pressing, and has a rich, nutty taste. Walnut oil is an excellent source of Omega-3 fatty acids, and it has several therapeutic properties, making it perfect for medicinal and beautification purposes. Walnut oil improves blood circulation, is an antiseptic, anti-inflammatory, anti-bacterial, anti-fungal, anti-aging, skin regenerative, and a skin toning miracle that has been slept on for too long. Several studies have shown the consumption of walnuts have amazing cardiovascular benefits including a study in the American Journal of Clinical Nutrition found a significantly greater decrease in total cholesterol and low-density lipoprotein. Their vitamins, phenolic acids, tannins, and flavonoids contribute to heart health, help fight diabetes, and improve cognitive functions. From eliminating dandruff to highlighting and adding shine to hair color, this oil has been touted as a great oil for hair and scalp. With its anti-fungal properties, walnut oil is a viable option for scalp health and relieving an irritated or infected scalp. Conditions like eczema and psoriasis are often hard to manage, but walnut oil can help relieve the discomfort. Since Omega-3s help with preventing cell damage, some use walnut oil either alone or in concoction to fight hair loss. 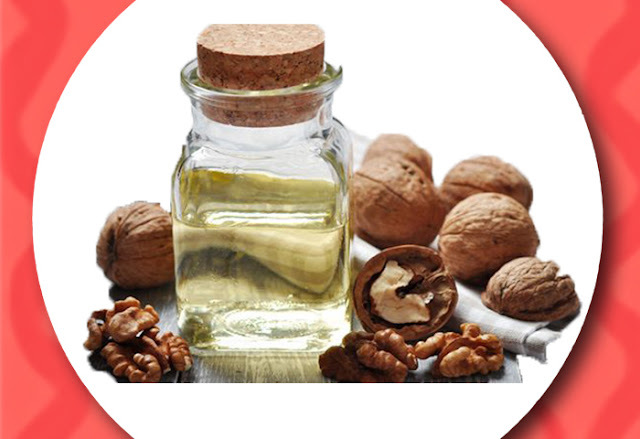 The potassium in walnut oil helps in regeneration of those cells and may accelerate hair growth. Walnut oil is great for both skin and hair. It helps with eliminating wrinkles over time and with anti-aging properties that assists your skin, hair, and scalp. Walnut oil is amazing alone, or in conjunction with other oils for a healthier hair and scalp. You can buy walnut oil, or you can make it yourself–if you have the right tools. We have a great recipe just in time for the cooler and dryer temperatures, outlined below. Try this simple pre-poo oil blend before you wash your hair next for shiny and healthier hair. Mix the oils together, and apply mixture to scalp until the entire head is covered. Massage in circles with firm pressure until head feels warmed, and then cover with shower cap and towel for at least one hour. Wash out with mild shampoo, condition, and style as usual. If you prefer to make your own walnut oil, it will take a few more steps but it is definitely achievable. Make sure walnuts are dry and fresh. Use the nutcracker to open the shells and extract the meat into a clean bowl. Begin grinding the walnuts using small portions, and grind down until they are fine. Place the ground walnuts into a cup with a little water, just enough to heat the mixture for 30 min. stirring constantly. Once done heating, place the hot walnut meat into an oil press, and squeeze the oil, making sure you have a bowl below the press. Filter the oil by pouring the oil through a cheesecloth into a clean bowl. It is best to keep the oil in dark bottles for storage initially, and then in the fridge for up to two months to make it last longer. The oil may thicken in the fridge. For an easier application, bring the oil to room temperature for an hour or two before using.